Hopefully yours, Connie: Infertility: A Nobel Prize in Medicine for IVF Pioneer! Infertility: A Nobel Prize in Medicine for IVF Pioneer! There is no question that the perfecting of in vitro fertilization has revolutionized treatment options for millions of infertile people world wide. Today the Nobel Prize in Medicine was awarded to Dr. Robert G. Edwards who, with his now-deceased colleague Dr. Patrick Steptoe, spent years perfecting the IVF procedure while battling controversy, lack of institutional funding and criticism on ethical and religious grounds. For those of us who have faced our own infertility struggles, it becomes easy to bask in the glow of this belatedly-awarded Nobel Prize. Drs. Edwards and Steptoe demonstrated more than medical brilliance in their work together, they also set a high bar for unwavering determination to overcome the many-pronged resistance to their scientific breakthroughs. The celebration of the birth in 1978 of Louise Brown, the first IVF baby, was the beginning of a revolution in infertility treatment, just as that very birth was met with intense criticism of IVF as subverting the natural order of how conception occurs. Ultimately medical follow-up on IVF babies demonstrated that the IVF technique is safe and does not pose a risk to the healthy development of IVF babies. And most criticism, except that of the Roman Catholic Church, has melted away as some four million babies worldwide have been conceived, to the joy of parents who considered IVF to be their last hope for pregnancy and parenthood. IVF is now used in 3 percent of all live births in developed countries. Since those of us who have grappled for years with infertility often come to feel singled out for unwarranted reproductive distress, I thought readers of this blog might be interested to know a bit about the multi-pronged battles waged by Dr. Edwards and Steptoe (Dr. Steptoe, who died in 1988, is not being named as a co-recipient of the Nobel Prize, as it is not awarded posthumously). My empathy for their ordeal is only surpassed by my gratitude that ultimately they triumphed so magnificently! Medically, Edwards and Steptoe did their work in England, devoting over 20 years to solving problems related to getting eggs and sperm to mature and unite successfully outside the body. They were denied government funding for their IVF research, but their persistence paid off in their abilities to procure private funds. They were attacked, both by clinicians and by ethicists, many of whom were ultimately won over as their own colleagues became more familiar with the successes of IVF. Dr. Edwards, who filed 8 libel actions in one day, proclamed "I won them all, but the work and worry restricted research for several years." Edwards's and Steptoes's initial medical research was slowed by a series of frustrations in being unable to get eggs to mature outside the body, then in being unable to get fertilized eggs to implant in the uterus successfully, and ultimately in transferring more than 40 embryos before obtaining their first pregnancy. That pregnancy was ectopic and was aborted before Louise Brown was born from the second pregnancy. But that was back in 1978. Why has it taken so long for the Nobel Committee to offer much-deserved public recognition to these IVF pioneers? Dr. Steptoe is now deceased, and Dr. Edwards, age 85, is "not in a position to understand the honor he has received today," says Dr. Michael Macnamee, a longtime colleague. Since the prize-giving committee's deliberations are confidential, it is not possible to know for certain about the delay in awarding the Nobel Prize. The New York Times reports that the committee shies away from controversial people and issues. Certainly the prolonged ethical objections to IVF may have contributed to the delay, as may have Dr. Edwards's political views as a committed socialist. Whatever the reason for the delay, today is a day to celebrate! 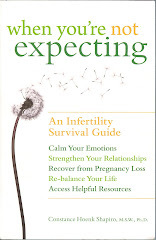 People with infertility the world over know what it is to wait, we know what it is to be misunderstood, we know what it is to persist through emotional turmoil and medical disappointment. Some of us know what it is to rejoice. In the spirit of empathy for Nobel Laureate Edwards's grit and determination, for his medical persistence and vision, and for his magnificent contribution to the joy of many families around the world, I join with millions of others to salute him! The first IVF child, was the starting of a trend in inability to conceive therapy, just as that very starting was met with extreme critique of IVF as subverting the organic purchase of how perception happens.